Dream Team, Bill Evans Quartet, Trio plus saxophone. For a fan of both Evans and Adderley this record is irresistible, playing together again after the Kind of Blue classic sessions. Rhythm section of MJQ provide the underpinnings. Waltz for Debby, Evans on the keyboard, but with a saxophone solo? Be still my heart. 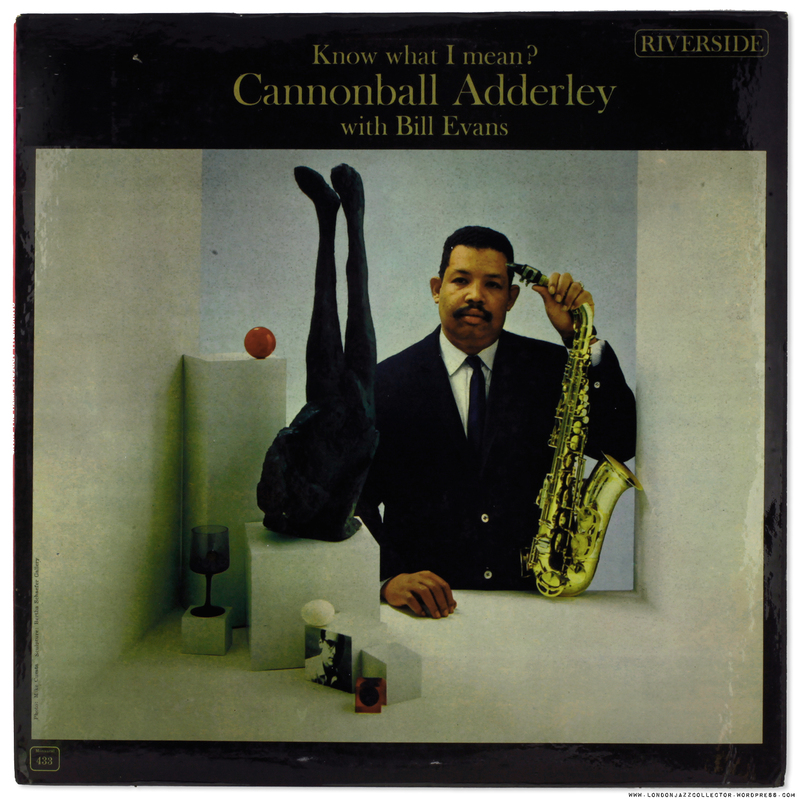 Adderley’s alto has wings, flies like an angel on the title track, belieing his “Cannonball” moniker. The Dutch pressings of Riverside are deceptive. At first I thought they were a little subdued compared with the British pressings, but if you boost the volume 10-15% they sound alive, as they should. Something about the way the Philips plant in Holland engineered things. They just need a little push to deliver that punch. Seller had not a lot to say about this one, mainly a seller of R&B, Beatles and the like. . “All sausage, no sizzle” , a phrase, for any of you who ever worked in marketing. The joy of a targeted eBay search based on artist, title and vinyl. Pops up on a Buy-it-Now offer, it must be like shooting grouse. The beaters beat, bird take to wing, gets twenty yards into the air before a “bang” sends it hurtling too earth. Sellers chose to sell it that way, no auction and sniping grief, just like old-fashioned shopping, sold and bought immediately, delighted. A little bit of surface noise, 1961 vinyl, your expectations are unrealistic if you expect silence. Once again, as with the Thelonious Monk Alone in San Francisco post, the mystery of missing artwork on Riverside/ Interdisk European editions. Both Dutch pressings by Philips. On the left, the LJC copy produced for the UK market (purchase tax codes pressed into the vinyl around the spindle-hole) made by Fontana (owned by Philips) No artwork. . The other a release by Philips itself – presumably for Holland or who knows where export, with artwork. Anyone who can shed light on the Philips / Interdisk madness, the floor is yours. This entry was posted in Bill Evans, Cannonball Adderley, Riverside and tagged Bill Evans, Cannonball Adderley, Connie Kay, percy heath, Riverside by LondonJazzCollector. Bookmark the permalink. Hi! Just listened to your track selection 1 on the know what I mean record post, and somehow, by accident you have recorded the know what I mean twice. Sorry, Waltz for Debby is such a wonderful recording that you have to put it on your blog for your listeners…. By the way: AMAZING blog!! Wish I could spent more time on your site! Album posted 2012 when I was using a little USB turntable, whose software was absolutely horrible, and I didn’t know what I was doing, it doesn’t surprise that there were a few mistakes. I’ll look to correct the rips in the next couple of days. UPDATE Feb 12, 2019, : replacement rips to audiophile standard are uploaded, including cover art and labels. Found an original US mono copy at a record show recently. I was flipping through a box of records on the floor, and Cannonball’s face and saxophone caught my eye. I did a double take and flipped through again to make sure I wasn’t seeing things. Then when I picked it up, I still wasn’t sure. Was it an Orpheum Productions Riverside, or an OJC? No, it was original, blue label mono, “Bill Grauer Productions” label. The only flaws are a drill hole cut out mark through the sleeve and the label of the record (that’s how they deleted titles back then, I guess), and the first song on side 2 (“Toy”) has a scuff which makes a noise every pass for about 15-20 seconds, but plays through. The rest sounds strong, and no groove wear. The sleeve (other than the cut out drill hole) is in pretty nice shape, with a strong spine and no seam splits. I love Bill, and I like some of Cannonball’s stuff too, so this was a no brainer. Even if the record turned out to be no good, the sleeve was so nice that if I ever found a better record, I’d have a nice sleeve to put it in. 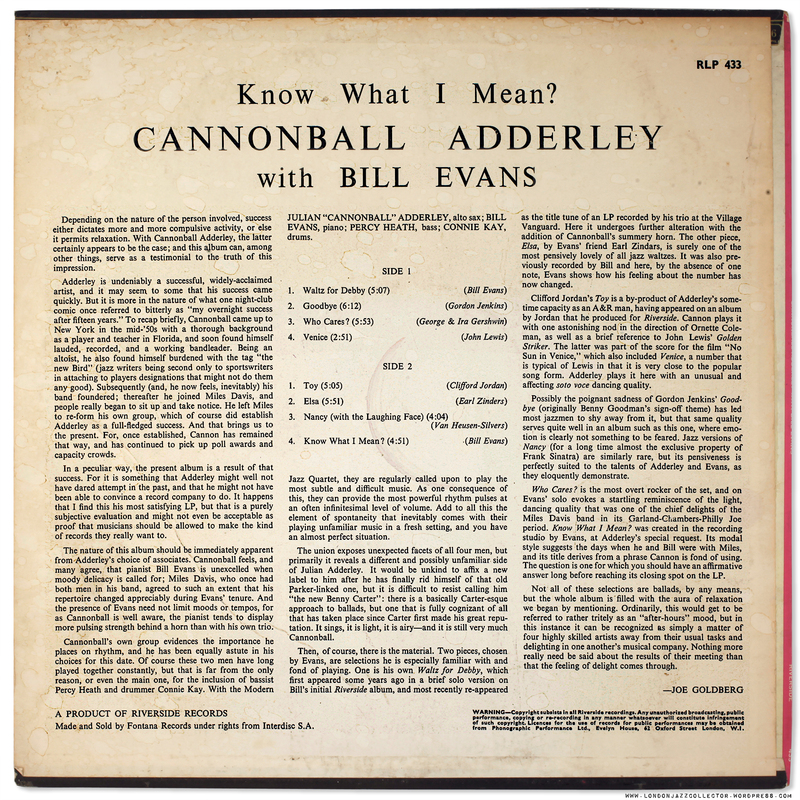 Also recently bought a sealed mono copy of Cannonball’s “Portrait of Cannonball” (which also features Bill) that should be coming my way shortly. well, the lp is finally here! about 9 days to come from australia is way faster than some u.s shipments. of course the UK (european) copy lack the gorgeous heavy cardboard laminated cover but carry its own 60’s charm. ok, this UK copy is def great and i could have lived happily wih it everafter then a u.s Lp showed up and i got it for a very decent price. prices seem to go down on this album or am i wrong? You will not hear a cleaner Cymbal! Nice, another one for the shopping list…. LOL> Yes, me too… I seem to have bitten by the 1st pressing bug. On the front cover it says “sculpture: Bertha Schaefer Gallery. Something to google, isn’t it? Apparently the gallery itself doesn’t exist anymore, but here you can find an extensive interview with the woman in question. I have a vinyl copy as well–an original blue label mono, but it’s got a wrecked cover and VG vinyl. Still enjoyable, but I have to step up and buy a clean copy of this gem.